The Setu Stool offers an elevated perspective on comfort and simplicity. An innovative Kinematic Spine bends and flexes as you move, whether you’re working at a counter surface or turning to speak with others. The seat and back are formed of a one-piece suspension fabric that responds to your weight, adapting to you the moment you sit down, no adjustment needed. 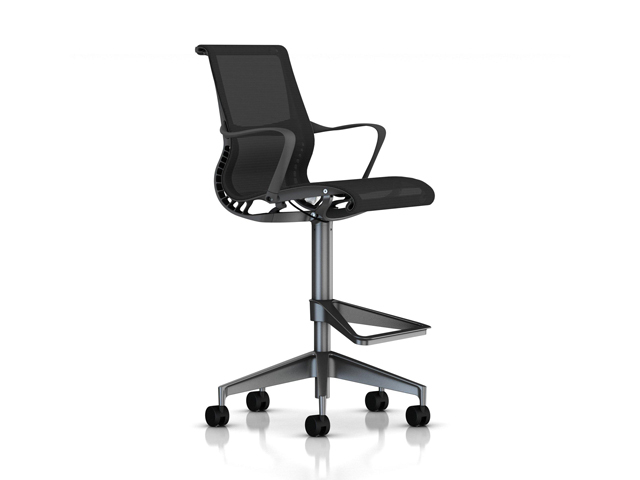 As with its sibling the Setu office chair, the Setu Stool has only a height adjustment; you merely sit, and the stool reacts to you. Two design innovations make this responsiveness possible. The stool's Kinematic Spine combines strength and flexibility to bend and move automatically with you. The Lyris 2 elastomeric suspension fabric not only conforms to you, but also lets air circulate so your body remains cool. "Shave it down to the absolute minimum"
Setu was created by the four designers of Studio 7.5 in Berlin, Germany: Claudia Plikat, Roland Zwick, Carola Zwick, and Burkhard Schmitz, who work together like a highly evolved organism—extremely lightweight, innovative, and eco-friendly. Their affectionate nickname for us is "the blueprint of the ideal client"—because of our long-term dedication to research, which they share. Studio 7.5 built 35 fully functioning prototypes—the first model of the kinematic spine was a chain—before homing in on the final design of this chair. The spine, the heart of the chair, took a long time to develop. 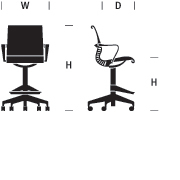 Before Setu, the seat and back of all kinematic chairs had to be separated and controlled with a hinge. But once Studio 7.5 had found the perfect material—polypropylene—and perfected the math and retooled the design over and over, they had the one-piece, flexible spine they had envisioned. Inspired by nature with its spiralling shape and contours, this unique feature was perfected by technology. Every bend, every corner and every line were painstakingly shaped, reshaped, and reshaped again, to create a balance between support and flexibility that lets Setu adapt to everyone. As to environmental issues, Claudia says, "It's inherent. We don't discuss it any more. It's part of our job to only design products that don't use up too much material or too much energy. We tried to shave it down to the absolute minimum." So the Setu chair weighs only 18 pounds. Less chair means less energy and material required to manufacture it. And it's 93 percent recyclable. For normal cleaning, wash surface with a soft cloth soaked in mild detergent and warm water. Rinse thoroughly and dry with a soft cloth. For normal cleaning, wash plastic surfaces with a soft cloth soaked in mild detergent and warm water. Rinse thoroughly and dry with a soft cloth. For normal cleaning, vacuum material as needed using an upholstery attachment. Vacuuming picks up dust and reduces the need for professional cleaning. To spot-clean fabric, immediately soak up the stain with a soft absorbent cloth. Do not dry the stain completely or it may set. The longer a stain is allowed to remain on a fabric, the more difficult it is to remove.